The following article is from the keynote speech at the 2001 TIR Association Conference in Portland, Oregon. I am a psychiatrist, trained at Stanford and Yale. I have made it a lifetime purpose to discover or invent helping techniques that are effective in a short period of time, easy to use, and easy to teach. This search has led to Traumatic Incident Reduction (TIR) and related techniques which I developed with the aid of colleagues, many of whom are here today. But along the way, I had to undergo a complete transformation in my orientation. My purpose here is partly to introduce you to TIR and other, related techniques that are highly effective in handling trauma and other aspects of the human condition. I must admit that my own personal agenda is to offer you a completely new way of looking at the helping process and the roles of the participants in this process. And so I will be concentrating today on bringing into focus an often neglected part of this process – the missing person. 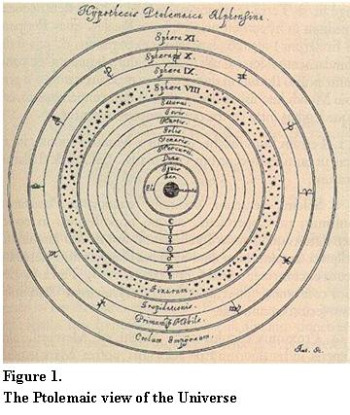 Until the mid-16th Century, the Ptolemaic view of the universe was prevalent (Figure 1). That this model should have been the first to arise is quite understandable, because it really seems natural to assume that we are at the center of the universe – after all, we are at the center of our universe of experience, and in our lives, we naturally think and act as though each of us is of supreme importance in our own world, as the pre-Copernican Leonardo da Vinci illustrated in his concept of “Man as the measure of all things” (Figure 2). 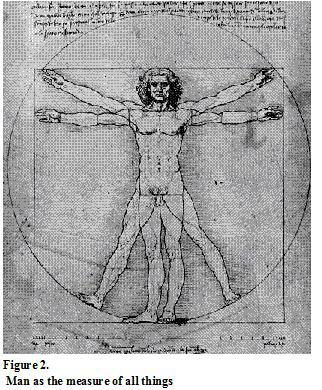 People were considered not only to be at the center of the physical universe but also at the center of their mental universe. They were supposed to be responsible – i.e., to blame – for what they did. Therefore, people with cognitive, emotional, or behavioral problems were considered ethically culpable, possessed, or otherwise morally or spiritually compromised. In other words, they were considered “bad” or “alien”, and were treated with exorcism, punishment, isolation, and incarceration, often in terrible conditions. The people that dealt with such individuals were called “alienists”. 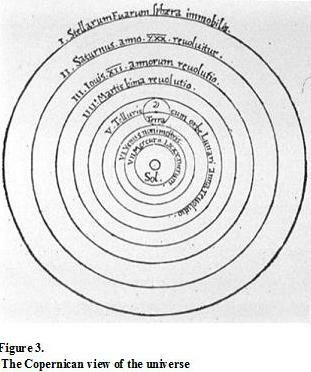 In the mid-16th century, the Copernican heliocentric view its infiltration, first in scientific circles, and eventually into the general world-view. The increasing success of the physical, objective sciences in general and medicine in particular led to the notion of treating these individuals as sick instead of bad, as being the helpless victims of their “mental illness”. This idea was a great improvement, in that such individuals were treated more humanely as “patients” instead of “aliens”, but in the process, the client – as an active, intelligent, capable component of the healing process and as the center of his or her subjective universe – was lost. Although Szasz and others have criticized the concept of mental illness as an oxymoron, it has persisted to this day, we see a wide variety of human characteristics and behaviors being labeled as symptoms of mental illness. Freud, a physician and neurologist, could not find a medical cause or cure for mental illness, so he devised a quasi-medical approach: psychoanalysis, the “talking cure”. He developed an elaborate conceptual system containing entities like the unconscious, the preconscious, the conscious mind, ego, id, superego, etc., to explain the workings of human emotions, thoughts, and behavior and to serve as the rationale behind his psychoanalytic methods. He referred to this conceptual framework as his “metapsychology” – the study of that which lay behind the manifestations of human experience. One place where Freud ran into trouble, however, was in the concept of the therapeutic alliance. According to theory, the analyst was supposed to work in alliance with the client, but it was unclear who or what the client was supposed to be in Freud’s theory. Sometimes the analyst would work with the ego against the tyranny of the superego and the incursions of the id. Sometimes, though, e.g. when addressing ego defenses, it seemed that the analyst worked against the ego. So with whom did the therapist have the therapeutic alliance? Between the ego, the id, and the superego, the person – the client – was lost, and so there could be no real therapeutic alliance. In 1950, Carl Rogers published Client-Centered Therapy, in which he challenged the medical model and its Copernican roots and once more put the missing person back at the center of his or her own world. In Rogerian work, the client is available to have a therapeutic alliance with the therapist, whom Rogers sometimes referred to as a “facilitator”. The facilitator’s role is to respect the authority of the client and to work in a non-directive fashion, accompanying the client on a journey of exploration though his/her world of experience, providing only empathic reflection of what the client says. The client occupies a central place in his/her own universe. Rogers sought to replace the medical model with one of personal growth, and he refused to consider that a doctor would have any particular claim to expertise in handling the cognitive, emotional, and behavioral difficulties that individuals experience in their lives. To the end of his days, he eschewed labels and diagnoses, and he was ever a champion of the lay practitioner, who would play the role of a facilitator of personal growth, instead of that of a doctor treating an illness. He was equally a champion of the basic wisdom, authority, and goodness of the client as the basic agent in personal growth. And indeed, the Rogerian approach is very congenial and creates a wonderfully safe session environment, since clients do well in an environment that respects their importance and their ability to be the primary cause in their universe. The non-directiveness of the Rogerian approach, however, makes it too unstructured and unfocused to handle serious problems like Post-Traumatic Stress Disorder (PTSD) in a reasonable period of time. In other words, while in Freudian work there is a missing person, in Rogerian work, there was a missing methodology. The challenge, then, is to find an approach that is structured and methodical, yet remains completely person-centered. At first sight, they seem incompatible. The answer lies in the fact that there is a difference between “person-centered” and “non-directive”. Note that different therapeutic modalities can fit into different categories: Rogerian facilitation, for example, is both person-centered and non-directive. Psychoanalysis, curiously, is the opposite: it is not person-centered because o the interpretation involved, but it is also not directive, because one is supposed to free-associate in an undirected fashion. Cognitive behavioral therapy is directive, but not person-centered, because the client’s beliefs are directly challenged by the therapist. Applied Metapsychology-based techniques fit into the remaining quadrant, being both directive and person-centered. It is quite possible to be highly directive, so long as the directions one gives do not intrude on the belief system of the viewer. Any set of directions presupposes a belief system, but the trick is to find aspects of human experience that are experienced by all people and would, of necessity, be part of anyone’s belief system. Not everyone, for instance, believes in Jungian archetypes or the Freudian superego, but everyone has – and therefore believes in the existence of – feelings, emotions, sensations, mental images of one sort or another, memories, and other incontrovertible elements of human experience. In his search for something that one could be entirely sure of, Descartes came up with the concept that the one thing we could be sure of is that we think. It is literally inconceivable to disbelieve in the existence of thought. The very thought that thought does not exist is itself a thought and refutes the hypothesis! Without having to get that tricky, however, we can say that it would be equally true to say, “I feel, therefore I am”, “I perceive, therefore I am”, “I remember, therefore I am”. In fact you could give a long list of basic elements of experience that must exist in order for us to live life at all. It is perfectly possible to refer to such elements in providing structure and giving directions without leading the client to any particular kind of conclusion. In TIR, for instance, once the client has come up with an incident to work on, we can ask the client when it happened, how long it lasted, etc., without intruding, so long as we accept the client’s answers without question, and without in any way interpreting their meaning or value. In other words, a systematic examination of the elements that are in common in all human experience is invaluable as the basis for any person-centered, yet structured and focused, helping method. We have adopted Freud’s term, “metapsychology” to describe this study, bending his usage somewhat, but preserving his sense that metapsychology is what, of necessity, should lie behind any psychological system and practice. Lacking such a foundation would be like trying to play chess without clearly defining what the pieces are and the rules by which they move. Only when you know the pieces and their moves, can you start mapping out effective winning strategies, or, indeed, play the game at all. Having found the missing person we can now find the missing methodology? Human experience and the human mind seems, at first, too ephemeral, complex, and chaotic to be subjected to systematic study, but it only appears so because the terminology used to refer to mental and experiential entities is often vague, inconsistent, and not agreed-upon. Basically, the fields of psychiatry, psychology, and psychotherapy constitute a Tower of Babel, in which there is a plethora of warring theoretical and conceptual structures and little experientially-based, mutually agreed upon lexicon in which people who want to communicate scientifically about human experience can speak to and understand each other. In order to have a coherent basis for agreement, we need to identify the elements of experience that are universal and hence, when clearly defined, can be the basis for the agreement that is so sadly lacking in the helping professions. This is the purpose and task of Applied Metapsychology. In Applied Metapsychology therefore, you will find that, as in the physical sciences, every term is carefully defined before it is used. With careful attention to precise definition of terms, patterns emerge from the chaos, and it becomes apparent that the world of experience, including the mind, is not chaotic at all, but has a definite structure and set of laws by which it operates. When the structure and laws of experience are understood, they provide clear guidance toward the development of structured and effective helping techniques like TIR. [Figure 4] A central principle of Applied Metapsychology for instance, is that in order to be aware of or to act on anything, there must be a distance between oneself and the object of awareness or action. If I am not separated in any way from the blackboard – if my eyeballs are glued to it, say – I will not be able to perceive it. In other words, I cannot perceive anything that I am being or that is part of me. If, in my experience, something is inside me, i.e., within the boundary that separates what is me from what is not me, I cannot observe it. Now suppose we look at the world from a person-centered viewpoint. The person is at the center of her world of experience surrounded by elements in her environment, by things that are part of her world. 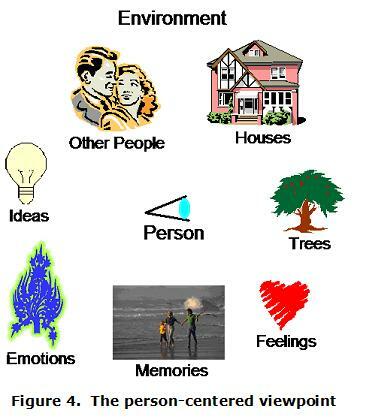 These would include trees, houses, other people, and the like, but certain mental elements are equally a part of a person’s world – things like ideas, emotions, feelings, and memories consisting of mental pictures of the past. In conventional therapy, one often asks the client to look inward to find these mental entities, but it should now be obvious from the foregoing discussion that if these elements of experience were truly inside the boundary that separates self from non-self, the client could not perceive them. Since, in our work with clients, we are going to ask the client to look at things like ideas and feelings, then they must not be inside but a part of the client’s environment. This may seem to be a trivial quibble, but it is not. It entails a profound change in the way we look at human nature. If we expect clients to examine the mental disturbances that are ruining their lives, we must consider that these disturbances are not part of the client but, rather, part of the client’s environment. In other words, in working with a client, we are not trying to change him, or even to get him to change himself. The client – the person – does not contain any of the imperfection with which he is surrounded. The client is basically good, as Rogers always said. With Rogers, that statement is an article of faith, but now we can see why it is the case. In fact, the client is basically perfect, in the person-centered view, because any imperfection we might want the client to work on must be conceived as outside the client – part of the client’s environment, not part of the client. Instead of trying to change the client, we are giving the client tools with which to engage in an environmental cleanup in the mental – and possibly physical and social – environment. This is the nature of the alliance that is formed between the now-present client and the practitioner, both are involved in the cleanup, and each has a specific role to play in this alliance, as we shall see. In taking the person-centered approach, we are not just being humanistic, warm, and fuzzy. We are adopting the only practical approach. Practically speaking, what do we have to work with in a session? A skilled and caring practitioner Direct knowledge of the client’s life or experience. Communication Direct influence over the client’s life or experience. An effective methodology Magic, telepathy or clairvoyance. Practically speaking, no one knows better than the client what the client is experiencing or what it means. And no one can change the client’s life and experience directly without going through the client. Thus, from a practical viewpoint, everything important done to help a client must be done by the client. It is the client, not the facilitator, who must become aware of what needs awareness and attention paid to it. It is the client who must gain control over emotions and other aspects of her experience. Therefore, in respecting and working with the client’s awareness and ability, we are only doing what is practical. An objective, manipulative approach works well with physical objects but poorly with people. If someone’s life is to change for the better, it is that person who must change it, from that person’s point of view. For instance, to take a relatively trivial example, if you want to help someone play better tennis, you must work with elements of experience that he or she is aware of. Although neuromuscular changes are no doubt taking place during the game, in coaching, you must somehow bring it down to an experiential level – perhaps getting the person to relax, to follow through, to shift physical weight in a certain way. The person-centered approach is inherent in any effective training or, indeed, any form of personal enhancement. In TIR and related techniques, there is a definite division of labor. We call the work the client does “viewing”, because the main tool we give the client is various systematic ways of directing his awareness toward his experience. For the same reason, we call the client the “viewer”. What the practitioner does is to facilitate the process of viewing by structuring the session, offering the viewer the appropriate tools in the appropriate order, by providing a safe space in which, without distractions, the viewer can freely view, by communicating effectively and being a good listener, and by giving the viewer a workable methodology with which to address his issues: specific viewing techniques. Thus we call a practitioner of Applied Metapsychology-based techniques a “facilitator” following Rogers’ usage. The viewer is like an executive – she has all the important ideas and does the important things that need to be done. The facilitator is like a secretary – he keeps track of what is being done in the session and provides a structure in which the executive – the viewer – can work effectively. The facilitator, like a secretary, has a subordinate role, but, like a secretary, he can and should be highly skilled. Thus we provide Communication Exercises to sharpen up communication skills, Rules of Facilitation that will ensure a safe space, and training in the Applied Metapsychology-based theory and methodology that the facilitator will need to use in a session. The viewer also becomes increasingly skilled in doing her job – finding and viewing elements of experience, acquiring insight from so doing, and, in the process, changing her life for the better. These two roles and skill sets are complementary, not competitive. The strictness of the division of labor must be absolute. If a viewer starts to take over running the session or the facilitator starts to offer insights or asks leading questions, the viewing process breaks down immediately. I have tried to present here the most important thing that the study of Applied Metapsychology has to offer: a profound reorientation in our view of the helping process, an Anti-Copernican revolution in which the client – the viewer – once more occupies the rightful place at the center of the life he or she is trying to change. I have shown that the existence of Applied Metapsychology allows for the creation of a highly structured, do-able, and effective methodology that can thrive in a completely person-centered environment without compromising its person-centeredness.